Dr. Robin Roberts, MBBS, FRCSC, MBA is a medical graduate of the University of the West Indies in Kingston, Jamaica. He undertook his residency training in urology at Dalhousie University in Halifax, Nova Scotia, Canada. He completed his Royal College of Canada certification examinations in 1986 and followed with a fellowship in renal transplantation. He returned to the Bahamas in 1987 and started out as the first urologist in the government health care services. His practice spans the entire spectrum of both adult and pediatric urology. Dr. Roberts has a major focus on male health with a special interest in prostate cancer management and research; he maintains an active partnership with a number of international cancer consortia. 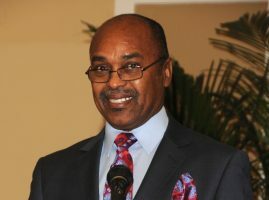 Dr. Roberts was instrumental in initiating the University of The West Indies School of Clinical Medicine and Research, The Bahamas, in which undergraduate medical students of the Faculty of Medical Sciences in the University of the West Indies can complete the final two years of their medical school program in the Bahamas; the School has advanced to include postgraduate programs as well. Dr. Roberts joined the University full time in 2009; he is a senior lecturer in surgery and now serves as the Director. He holds an MBA in Health Care Policy and Administration from the University of Miami; he is a past president of the Caribbean Urology Association, the Bahamas Family Planning Association and the Medical Association of the Bahamas.